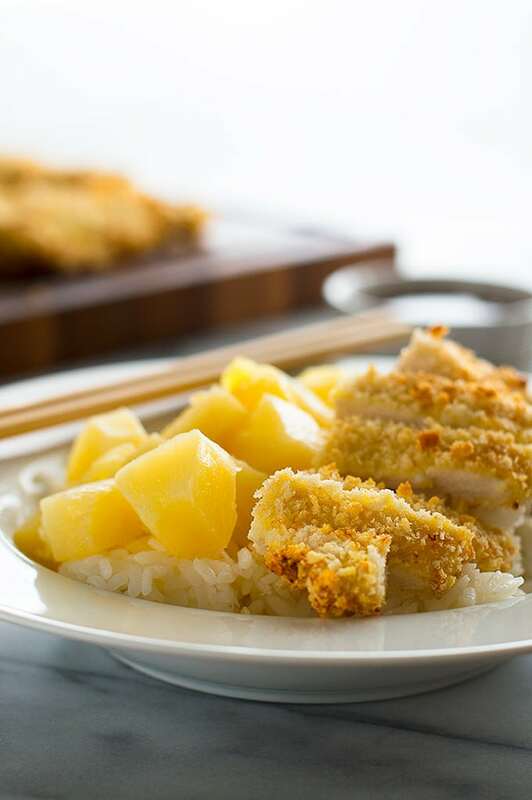 Easy Baked Chicken Katsu is a delicious, lighter take on the fried original. 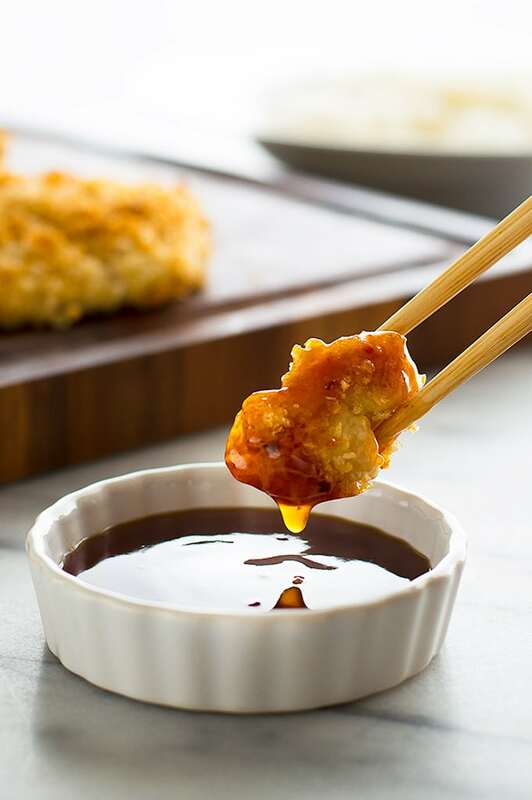 Pair with a simple sweet and tangy homemade Pineapple Katsu Sauce and it might just be your new favorite dinner. 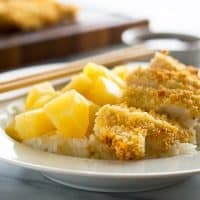 Today I’m sharing one of my favorite Japanese dishes lightened up a little for January, Baked Chicken Katsu (or Torikatsu)! Folks, you are in for a treat. I LOVE this recipe. Traditional Chicken Katsu is chicken cutlets coated in panko and then shallow or deep fried in oil. It’s amazing, it’s delicious, but it’s also kind of a pain to make. My Baked Chicken Katsu is chicken cutlets, coated in panko and then baked. It’s amazing, it’s delicious, and it’s the easiest thing in the world to make. No worrying about splattering oil or making a mess, you just coat your chicken cutlets in panko and plonk them in the oven. You still end up with a fabulously crunchy chicken exterior, but without all the mess and heaviness of deep frying. 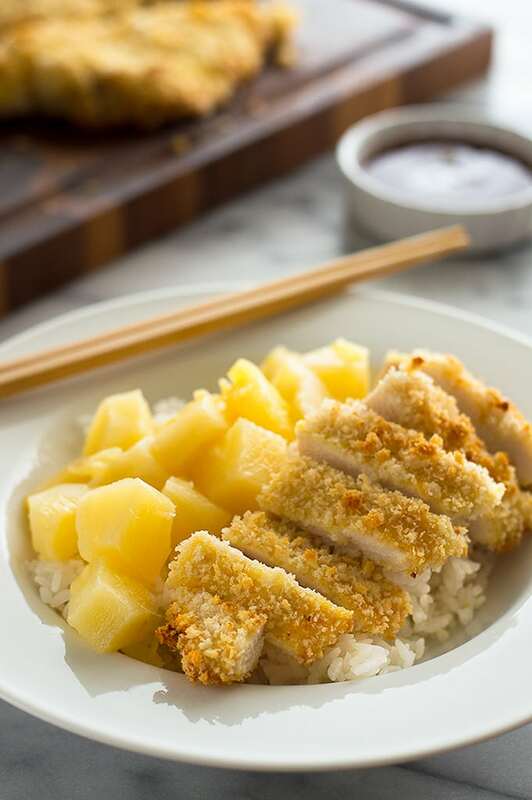 And my favorite part about this recipe, the part that makes everything worthwhile is the sweet and tangy pineapple katsu sauce that goes with it. It’s made with ingredients you probably already have in your pantry (maybe you’ll need to make a store run for the pineapple), and is perfection. You just simmer everything together while your chicken bakes, and by the time your chicken is done, you have a thick, fabulous sauce for dipping. As written, this Baked Chicken Katsu recipe generously serves 2. To change the recipe yield, hover over the number of servings (or click if you are on mobile) and slide the slider–no preparation changes are necessary for doubling. Baked Chicken Katsu is a delicious, lighter take on the fried original. Pair with a simple sweet and tangy homemade Pineapple Katsu Sauce, and it might just be your new favorite dinner. Preheat oven to 450°. Line a baking sheet with foil and grease well. Cut your chicken breast in half horizontally (butterfly the breast and cut all the way through) by placing one hand on top of the breast and running the knife through the center of the meat so you have two thin, even pieces. Lightly salt both sides of your chicken pieces. Line up 3 containers on the counter large enough to fit your chicken. Place flour in the first, beaten egg in the second, and panko in the third. Put your prepared baking sheet at the end of the assembly line. Coat your first chicken piece well in flour, followed by the egg, and then panko. Place on prepared baking sheet and repeat with the second chicken piece. Spray a very light spray of cooking oil over the tops of the breasts--this helps them brown. Bake for 15 to 20 minutes, until an instant-read thermometer inserted into the center of the breasts reads 160°F. Remove chicken from oven and allow to rest for 5 minutes. While your chicken bakes, in a very small bowl, whisk together soy sauce and cornstarch until all lumps are gone. Add mixture and the rest of the sauce ingredients to a small saucepan. Bring to a simmer over medium-high heat (turn down if mixture begins to boil) and simmer for 3 to 6 minutes until thickened. Remove from heat. Slice chicken breast and serve over rice with a side of pineapple (if desired) and sauce on the side for dipping. Enjoy! Approximate nutritional information is for a 10-ounce chicken breast, and calories do not include pineapple chunks or rice. To shallow fry: Over medium-high heat, heat about 1 cup of oil in a large skillet--oil should be about 1/4-inch deep. You'll know oil is ready for frying when you can dip the end of a wooden spoon into the oil and bubbles form around the spoon. 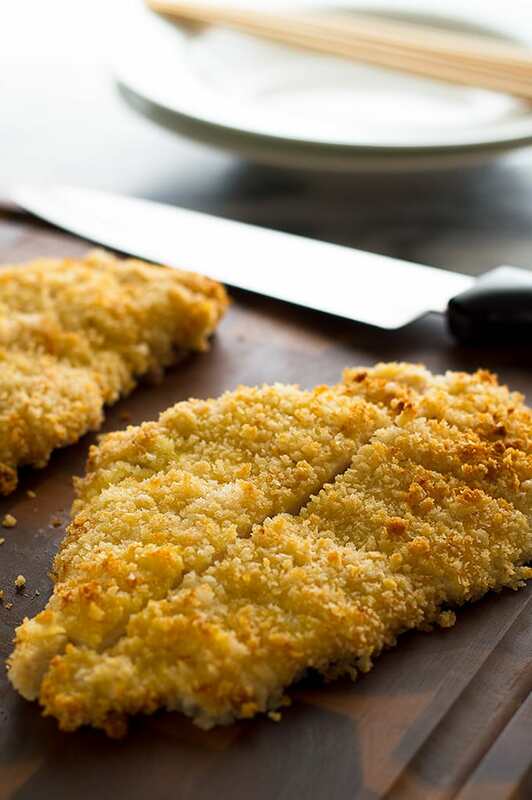 Cook panko-covered breasts for 3 to 5 minutes per side (longer if they are very large), until an instant-read thermometer inserted into the center of the breasts reads 160°F. *This post may contain affiliate links, which means I receive a small commission if you make a purchase using them. There is absolutely no additional cost to you and it helps keep the lights on around here/pay my student loans. 😉 Thanks for supporting Baking Mischief!